Have questions about us or our printing process? Here are a few of the more commonly asked questions we get. If there's a question you have that isn't answered here, don't hesitate to contact us! What resolution does my file need to be at? We recommend that your file should be set to 300 dpi. This includes the resolution of images in the file as well. Read more tips on preparing your file for print. What file type should I send my project as? We can print from a variety of file types, including PDFs, JPGs, PNGs, INDDs and PSDs. We recommend sending your file as a PDF, we can also print from JPGS and INDD or PSDs, but it’s important to include all necessary fonts and images when providing adobe files. Learn more about packaging INDD files. Which file format is best for pictures? We recommend saving the pictures in your project as a PNG or TIFF file. These file options are much bigger than a JPG, but the quality is worth it, especially when images are a large focus of your print. Should my file be set to CMYK or RGB? Why does it matter? CMYK is the best color setting for printing, as the colors are based on what the printer uses to match the colors of your screen. RGB is how a computer reads the screen. It’s important to create your document using a CMYK color scheme so the final product is closer to how it looks on your screen. Read more about the difference between CMYK and RGB. What are bleeds, slugs, and printers marks? Do I need them? Bleeds, slugs, and printers marks account for the difference in print and trimming necessary to make sure your design extends all the way to the end the paper without leaving an unnecessary white border. Our team of graphic designers can add the appropriate bleed and slug for you to make sure the final product turns out to be exactly what you had in mind! How much bleed do I need for my project? Each project varies, but a general rule is to have a bleed on your file somewhere between .125” and .25” of a bleed on all sides. If you have questions, don’t hesitate to give us a call for what bleed we would recommend for your project! What kind of paper is the right type for my project? There are a wide variety of paper types, including gloss, silk, or matte-coated paper, and each project may require a different kind of paper. We’ll help you pick the best one for your project based on your budget and the kind of print you’re looking for. If you want to know if we can print what you have in mind, give us a call! Embossing is the process of creating a raised pattern on the paper. Embossing is a great way to add a bit of flare to the design of your project. We also do foil embossing, where foil is added to the raised design, adding a touch of shimmer to the final product. Offset printing is a type of print that’s best for large quantities of prints. The paper is fed through an offset press where a rubber roller transfers the ink onto paper. Offset printing is great when you want a large number of high quality prints that are all the same design. Learn more about our offset printing services. Digital printing differs from offset printing as instead of putting the image on a plate that then transfers to the paper, the image is applied directly to the printed surface. Digital printing is a great option for fewer prints or prints that have custom variable elements, such as ticket numbers or custom addresses. Learn more about our digital printing services. Thermographic printing is when the ink of a design is raised to give a textured feel. It’s similar to embossing, but instead of the paper being raised, the ink itself gives the depth to the design. Letterpress printing is similar to embossing and debossing. It is when the text or image is imprinted into the paper to create texture and some depth to the printed project. Pantone has a Pantone Matching System (PMS) that’s best used for print, paint, fabric, and plastics that makes it easier to match the exact color you need from screen to print. If the exact color is important, find the Pantone color that best matches what you need, and we can print in that color. How big of a project can you print? We recently acquired a new wide format printer that can print any length and up to 46” in width on flat surfaces that are less than 2” thick. We can print a variety of wide-format projects, including trade show displays, banners, and step and repeat backdrops. I have a unique project in mind. Can you print it? If you have a project in mind but aren’t sure if we can do it, give us a call! We’ll be happy to answer any questions you have about whether or not we can print your project. Yes! We can print white ink on a variety of colored papers. If you have a project that requires white ink on a colored surface, just give us a call. We are happy to make your print a reality! We pride ourselves on our fast turnaround time, but each project varies depending on the size and scope of what you’re looking for. Give us a call, and we’ll give you an estimate on how soon we’ll be able to get your project done. Yes, we’re happy to provide a proof if you’d like one. We will communicate with you throughout the entire printing process to make sure you’re happy with the final project! Do I need to come in person to give you my project? Nope! Our online system makes it possible for you to send in all the details of your project through our website. You can also call us to get your order started. But, if you’d like to come in to discuss your project, you can do that too! 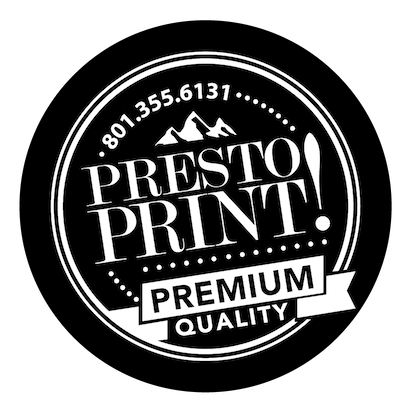 How does the process work with Presto Print? You send us the details of your project, and we’ll provide you with a free quote and an estimate of how long your project will take. From there, we take care of the rest. When you’re ready to pick up your prints, we’ll even shrinkwrap them to make them easy to carry if you’d like us to! How soon will you contact me with a free quote? When you fill out the form on our website or send us the details of your project, we’ll get back to you as soon as we can! Help! The color on my print looks different than the screen! Don’t worry, that’s completely normal! Each screen shows color a little differently. If it’s important that your project matches the exact color, we can help you get a Pantone® color that can best match the color of your project with the physical print. I don’t have the equipment to get my file print-ready. Can you help? Yes! Our team of graphic designers can help you get your file print-ready, at an additional cost. We can make sure it’s set up properly for print, including any necessary bleeds and slugs to make sure your print looks exactly how you’re envisioning it. I don’t have a design. Can you make one for me? Yes! We have a team of graphic designers that can help you create a design. Whether you’re looking for a new business card or an invitation for an event, we can do it all! Just give us a call and send us the details of what you’re looking for, and we’ll give you a free quote.